Have you ever tried to cut a cinnamon stick into pieces? If you haven’t, I don’t recommend it. I also recommend that when you ask the nice Wegman’s employee if they carry cinnamon sticks and he tells you they carry whole ones or pre-cut ones, you don’t save $1.50 by purchasing the whole ones. The main reason why I chose to make these cupcakes is because I thought a cinnamon stick garnish on the top was extraordinarily pretty. Mine, however, didn’t turn out quite that way since cutting through a cinnamon stick is a bit like trying to remove tree bark with your teeth. Scissors didn’t work. Kitchen shears didn’t work. A serrated knife didn’t work. The only thing that worked was breaking them into jagged completely uneven pieces with my hands. 1. Preheat the oven to 350. Line a cupcake pan with paper liners. 2. Sift the flour, cinnamon, baking powder, nutmeg and salt into a bowl. In another bowl, stir together the pumpkin, butter, milk and vanilla. 3. In the bowl of a stand mixer with the whisk attachment, beat the eggs and egg white on high speed until they are foamy, at least 5 minutes. Gradually add in the sugar a few teaspoons at a time. Mix for another 8 minutes. 4. Turn off the stand mixer and add in half of the flour mixture and all of the pumpkin mixture. Return the mixer to low speed until combined, then turn off, add the remaining flour and turn back on, mixing until combined. 5. Spoon the batter into the cupcake pans, filling 2/3 – 3/4 of the way full. Bake for 15 minutes or until a toothpick inserted in the center comes out clean. Transfer to a wire rack and let cool completely. 1. In the bowl of your stand mixer with the paddle attachment, beat the brown sugar, cream cheese, cinnamon and salt on medium speed until the mixture is smooth, about 3 minutes. 2. Add the chocolate and vanilla and beat for 1 more minute. 3. Either spread the frosting over the cupcakes with a spatula or transfer the frosting into a piping bag fitted with a tip of your choice and pipe the frosting onto the cupcakes. 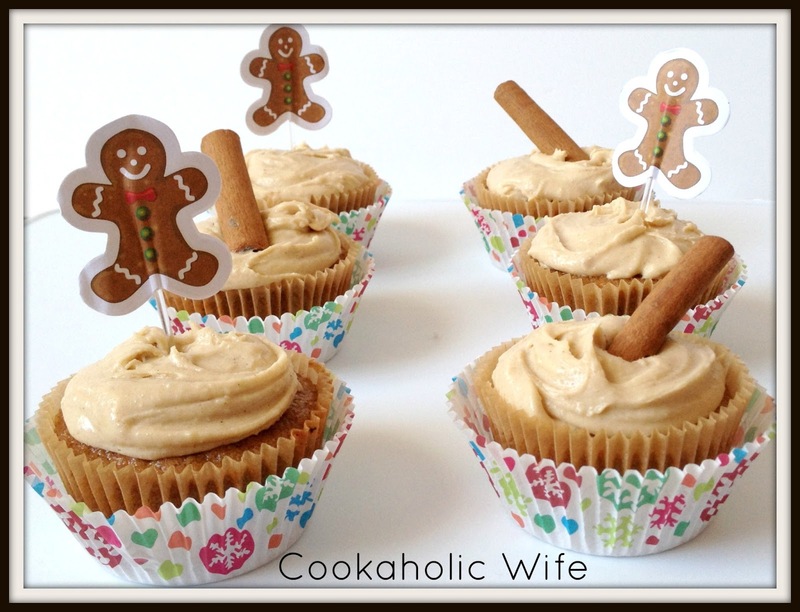 Top each cupcake with a cinnamon stick garnish if desired. Even though the cinnamon sticks and I didn’t get along, these were some really tasty cupcakes. They were super moist and the frosting was just sweet enough to make it feel less healthy than it actually is. Yum these look great! White chocolate cream cheese frosting with cinnamony cupcakes sounds delicious.